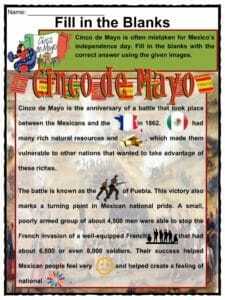 Cinco de Mayo means 5th of May in Spanish and it is also the anniversary of a battle that took place between the Mexicans and the French in 1862. Cinco de Mayo means 5th of May in Spanish and it is also the anniversary of a battle that took place between the Mexicans and the French in 1862. It is a national holiday in Mexico and is mainly observed in the state capital of Puebla. Cinco de Mayo is also becoming a popular holiday in the United States to celebrate Mexican culture. 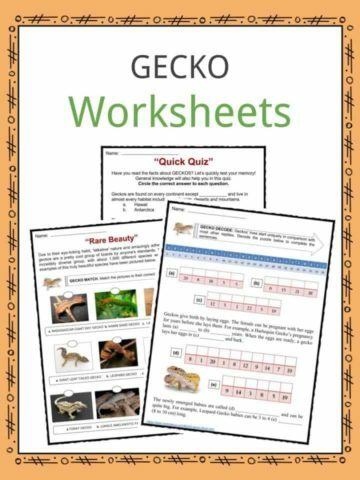 See the fact file below for more information on Cinco de Mayo or alternatively, you can download our 22 page Cinco de Mayo worksheet pack to utilise within the classroom or home environment. 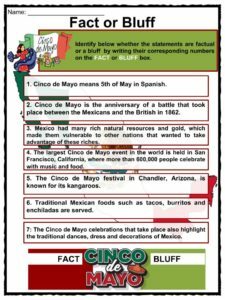 Cinco de Mayo means 5th of May in Spanish.It is the anniversary of a battle that took place between the Mexicans and the French in 1862. 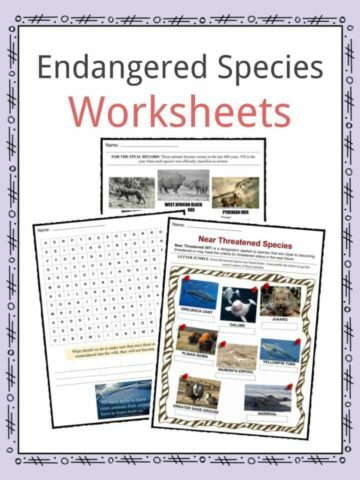 Mexico had many rich natural resources and gold, which made them vulnerable to other nations that wanted to take advantage of these riches. The battle is known as the Battle of Puebla. This victory also marks a turning point in Mexican national pride. A small, poorly armed group of about 4,500 men were able to stop the invasion of a well-equipped French army that had about 6,500 or even 8,000 soldiers. 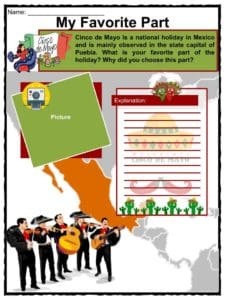 Their success helped Mexican people feel very happy and helped create a feeling of national unity.While Cinco de Mayo is a national holiday in Mexico, it is mainly observed in the state capital of Puebla. 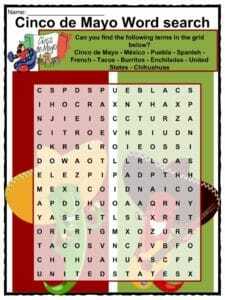 However, in the United States, it is becoming a popular holiday to celebrate Mexican culture. 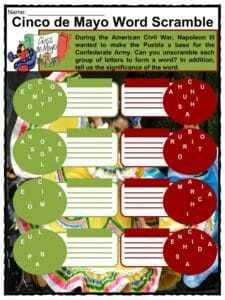 On May 9 1862, Mexican President Benito Juárez declared a national holiday called The Battle of Puebla Day or Battle of Cinco de Mayo. However, it is no longer considered a national holiday today. The largest Cinco de Mayo event in the world is held in Los Angeles, California, where more than 600,000 people celebrate with music and food. The whole event is called Festival de Fiesta Broadway. 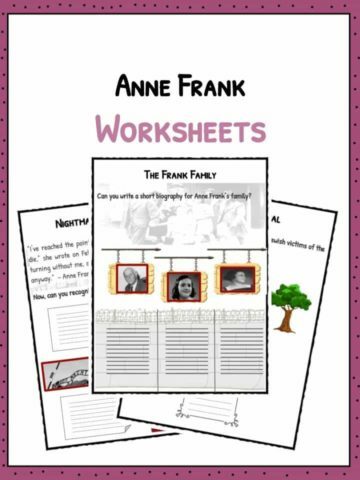 In 1933, U.S President Franklin Roosevelt created the “Good Neighbor Policy” enabling good diplomatic relations with Latin American countries. However, it was only in the 1970s and ‘80s when Cinco de Mayo became a popular event in the U.S. In 2005, under the administration of George W. Bush, Cinco de Mayo became recognized as a national holiday to be celebrated in the U.S because of its historical significance. According to Forbes, Americans eat 81 million tons of avocados during Cinco de Mayo. Two other big festivals are held far from Mexico, in Denver, Colorado, and St Paul’s, Minnesota, but they draw hundreds of thousands of participants.The Cinco de Mayo festival in Chandler, Arizona, is known for its Chihuahuas! There are Chihuahua parades, races and pageants. At the end, a King and Queen of the Chihuahuas are crowned. Traditional Mexican foods such as tacos, burritos and enchiladas are served. The Cinco de Mayo celebrations that take place also highlight the traditional dances, dress, and decorations of Mexico. Mayo Boogie as part of celebrating Mexican culture. 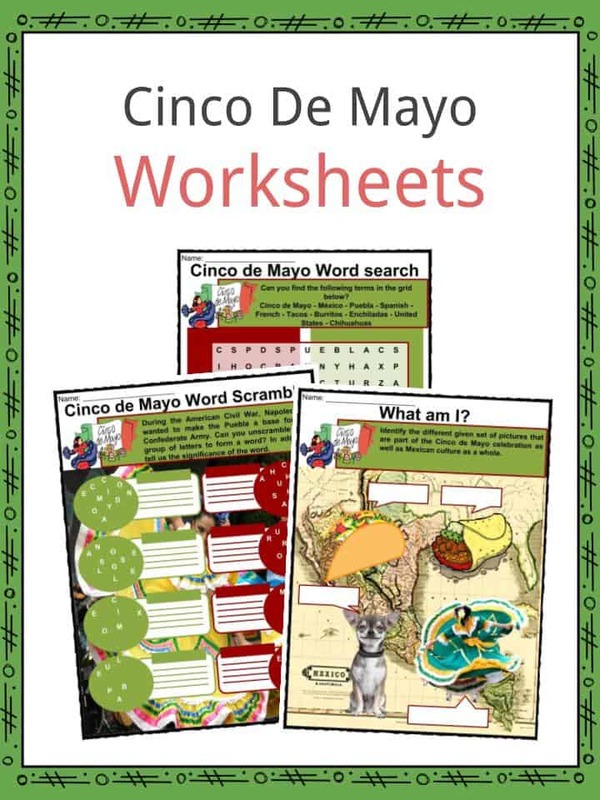 This bundle contains 11 ready-to-use Cinco de Mayo Worksheets that are perfect for students who want to learn more about Cinco de Mayo which means 5th of May in Spanish and it is also the anniversary of a battle that took place between the Mexicans and the French in 1862. It is a national holiday in Mexico and is mainly observed in the state capital of Puebla.